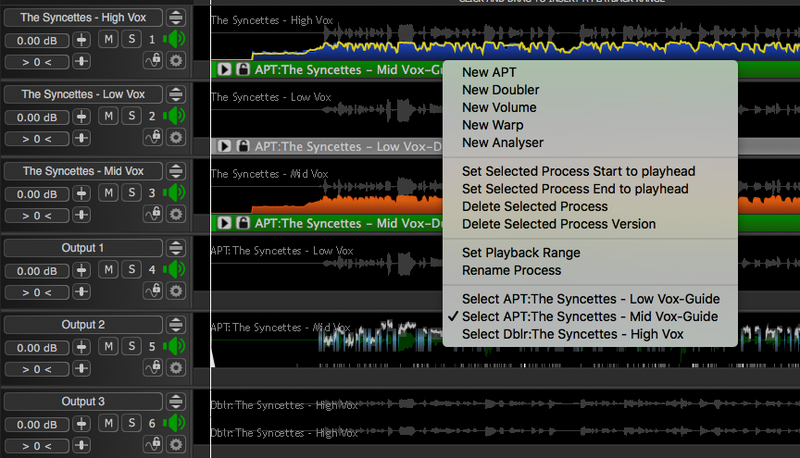 RIGHT CLICKing a Process Control Track (in this example, the The Syncettes - High Vox) will pop-up a window that displays all the processes that are positioned where the user clicked. Selecting its name from the list will "pop it to the top of the stack" of processes, making it visible on the screen, and show it as selected. In the example shown right, 2 APTs and 1 Doubler use the Guide section shown and the second APT "...Mid Vox-Guide" has been selected and is shown selected in the Process Control Track i.e. at the top of the "stack".